Internet Service Provider, check coverage, online application. TM Internet Service Provider (unifistreamyx.info) is a TM outlet concept initiated by TM. We are the one stop centre for excellent customer service and communications solutions. 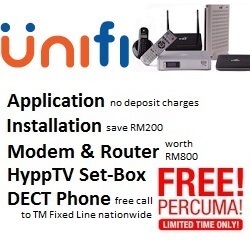 At our TM site, you can apply Streamyx and UniFi. We aim to deliver cutting-edge communications, information and entertainment services. Our experienced and dedicated staffs are here to serve you, regardless where you are. Our sales team nationwide will contact you at your convenience upon request for broadband subscription and registration. We strike to provide exceptionally good service to all our customers.